How Does a Push Pop-Up Tub Drain Work? The bathtub drain stopper is what keeps the water in the tub while you bathe. If the stopper isn’t working, the water will not all stay in the tub, which is frustrating. Using a replacement tub stopper can fix the drainage problem in your tub as long as you install it correctly. The bathtub drain stopper is what keeps the water in the tub while you bathe. If the stopper isn’t working, the water will not all stay in the tub, which is frustrating. 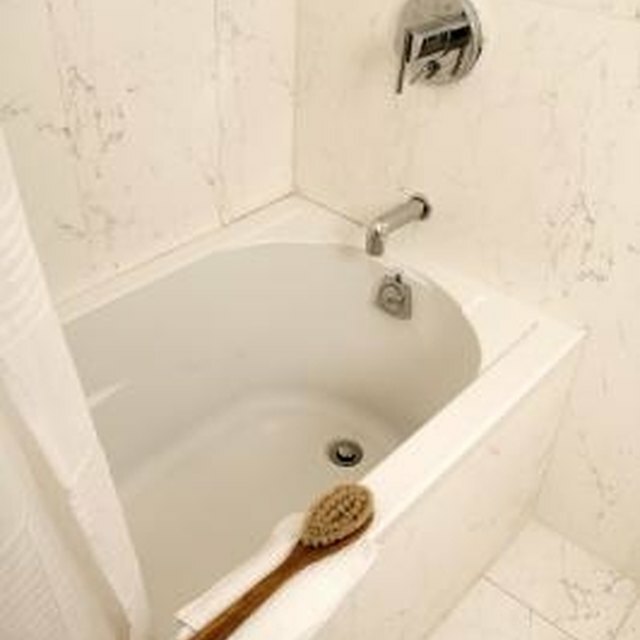 Using a replacement tub stopper can fix the drainage problem in your tub as long as you install it correctly. Measure the size of your drain with a tape measure so you can determine the correct-sized replacement stopper. Remove the old bathtub drain stopper. If it is a rubber stopper, pull it out of the drain. If it’s attached to a chain, unscrew the back of the chain from the inside and remove the old stopper from the chain. If it is a metal press-in stopper, unscrew it from your drain with your fingers or pliers. Place the new rubber stopper on the chain and screw it in place. Screw the new metal press in stopper into your drain with your fingers or pliers. What Is a Drain Spade? What are the Costs of Pond Building?